Terrain D.O.G. Reflective Neoprene Lined Large Harness | Florida Farm & Feed, Inc. Explore any terrain in perfect comfort with this neoprene-lined harness that offers the right combination of pressure distribution and comfort. Lined at the belly and chest straps with contrasting neoprene, this harness offers optimum comfort during even the longest days jam-packed with activity. 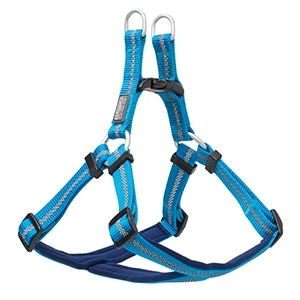 Four slides allow harness to be easily adjusted to just the right size to maximize your dog's range of motion. Reflective safety stripe is woven-in for added visibility. Measure (in inches) around the body (behind front legs) of your dog for the perfect size. Nylon measures 1" wide. Fits pets with a 20"-33" girth.